(1983) "Against All Odds (Take a Look at Me Now)"
"Against All Odds (Take a Look at Me Now)" (also titled "Against All Odds") is a song by English drummer, singer and songwriter Phil Collins. It was recorded for the soundtrack to the 1984 film of the same name. It is a power ballad in which its protagonist implores an ex-lover to "take a look at me now", knowing that reconciliation is "against all odds" while considering it worth trying. The single reached number two in the United Kingdom, while it peaked at number one on the Billboard Hot 100 in the United States, the first of seven US number ones for Collins in his solo career. "Against All Odds (Take a Look At Me Now)" also topped the charts in Canada, Ireland, and Norway. Collins was approached to write the title song to the film Against All Odds while it was still in its "rough cut form". At the time the soundtrack was being completed, Collins was on tour with Genesis. Director Taylor Hackford flew into Chicago to see one of the band's concerts. Collins watched the movie on a videocassette recorder in his hotel room and agreed to appear on the soundtrack. Originally titled "How Can You Just Sit There? ", the song was initially from the sessions for Collins' debut solo album Face Value (1981). Collins wrote the song, while arranger Arif Mardin produced it. The piano performance is by New York musician Rob Mounsey. Piano, keyboard bass and a string section arranged and conducted by Mardin were recorded at RCA Studios, New York, while Collins recorded vocals and drums in Los Angeles. On episode 339 of This American Life, "Break Up", Collins relays that the song was inspired and written shortly after the breakup between him and his first wife. In the interview he says that the divorce transformed him from being a musician into also being a lyricist. The song was first included on a Collins album on the 1998 compilation Hits, and it also appeared on his compilation Love Songs: A Compilation... Old and New (2004). A live performance of the song also appears on the Serious Hits... Live! album. In 2015, Collins released the original demo recording from the Face Value sessions as part of his Take A Look At Me Now project. 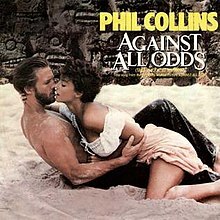 "Against All Odds" was created explicitly for the movie, although it was based on an earlier unreleased song Collins had written in 1981. Hackford, who previously used a song for the 1982 American drama film An Officer and a Gentleman, planned the same for the neo-noir 1984 film Against All Odds, which is a remake of Out of the Past. When he signed with Atlantic Records, he was provided with a roster of artists, among whom Collins was chosen to render the film's theme song based on the quality of his voice. Hackford said that it was a "textbook case of designing a song to reflect what the film is". The song appears in the movie as background music during the closing credits. Writing for the soundtrack's review, Allmusic editor Heather Phares claimed that the movie is best remembered for the inclusion of Collins' "classic theme song". Phares added that the song "remains not only one of Collins' definitive singles, but one of the 1980s' best love songs". Director Hackford also had the same view, stating that it "decidedly" helped the film: people identified the song with the film and came to watch it. When the single reached the top five, it contributed to the increased box office sales of the movie. "Against All Odds" won the Grammy Award for Best Pop Vocal Performance, Male in 1985, was nominated for Song of the Year and for an Academy Award as well as for a Golden Globe both in the Best Original Song categories. At the Academy Awards ceremony, Collins was not invited to sing his song on stage and instead sat in the audience as dancer Ann Reinking gave a mostly lip-synced vocal performance accompanied by a dance routine. Reinking's performance was poorly received by critics from the Los Angeles Times and People, as well as by Collins himself in a Rolling Stone interview. When another song Collins performed for a movie, "Separate Lives", was being nominated for an Academy Award, in interviews about the original snub by the Academy for "Against All Odds", Collins would jokingly say "the hell with him - I'm going up too", referring to what he would do if the Stephen Bishop-written song were to win the award. Collins lost to the Stevie Wonder song "I Just Called to Say I Love You". Rapper RZA named "Against All Odds" as his favourite power ballad in an article on such songs in Spin. After its release, "Against All Odds" peaked at No. 2 as a single in 1984 and became Collins' third top-ten single in the UK. In the U.S., it peaked at No. 1 on the Billboard Hot 100 for three weeks in the spring of 1984. Billboard ranked it as the No. 5 song for 1984. It is the first of six songs by Collins written specifically for a film soundtrack that would appear on the Hot 100. The single's music video was directed by Taylor Hackford, produced by Jeffrey Abelson through Parallax Productions and cinematographed by Daniel Pearl. Hackford was paid US$20,000 (out of a total budget of US$45,000) for a complete Collins clip. The music video was released in February 1984. A No. 1 MTV video for several weeks, MTV ranked it as No. 4 four in its 1984 year-end top 20 video countdown. Gary LeMel, music supervisor at Columbia, felt the music video on MTV increased Against All Odds' box office takings by at least US$5 million. The concept for the video was created by Keith Williams, a Welsh-born writer who had already worked with Abelson on the video for "Dancin' With Myself" (Billy Idol), and who would go on to also create concepts for "Holding Out for a Hero" (Bonnie Tyler) and "Ghostbusters" (Ray Parker, Jr.) for the same producer as well as "Say You Say Me" (Lionel Richie) from White Nights, which Taylor Hackford also directed. "Crybaby" / "Can't Take That Away (Mariah's Theme)"
(2000) "Against All Odds (Take a Look at Me Now)"
American singer Mariah Carey co-produced her version of the song with James Harris III and Terry Lewis for her seventh studio album Rainbow which was released in 1999. It was released as the fifth and final single from the album on August 8, 2000. Carey co-produced the single edit of the song with Steve Mac. Although the song was promoted as part of Carey's Rainbow in the U.S., it was not released as a commercial or radio single there. It was initially released in some markets in early 2000. This was also the last single with her then label Columbia. The song reached the top twenty in several countries. The highest peak of the song was number two in Norway. The video for the Carey version of the song, directed by Paul Misbehoven, consists of a montage of clips of Carey singing the song from her various Rainbow World Tour stops to cullings from her Homecoming special. 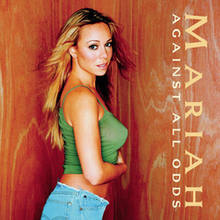 Mariah Carey's cover of "Against All Odds (Take a Look at Me Now)" received positive reviews. Danyel Smith of Entertainment Weekly wrote: "Listeners with an eye on the tabloids could read her close, ringing interpretation of Phil Collins' 1984 hit, "Against All Odds (Take a Look at Me Now)," as a postmortem on her bittersweet affair with Yankee shortstop Derek Jeter and a poignant evocation of the couple's shared mixed-race heritage ("You're the only one who really knew me at all")." L.A. Times' Elysa Gardner called this cover "surprisingly faithful, forthright" and "she resists her tendency to over-embellish notes and focuses on what really matters: the melody and lyrics." MTV Asia editor Dara Cook wrote: "Mariah festoons herself in Phil Collins' 1980s melodic garb, appropriately pret a porter with overwrought emotion. She delicately ascends the sparely accompanied first verses—but alas, that damn drum roll soon sounds and the bouffant strings and vocal gymnastics ensue." Rolling Stone's Arion Berger was not happy with the cover selection which he called a "drippy Eighties power-pop hit." 20 second sample of Mariah Carey and Westlife's "Against All Odds"
Carey re-released the song in collaboration with Irish boyband Westlife. The song was released as the first single from the band's second album Coast to Coast. The song was released in September 2000, a month after Carey's solo version. Carey's vocals from the solo version were retained for the duet, though the instrumental track was reproduced with a more organic sound complete with violins. The music video shows Carey and Westlife recording the song and exploring the island of Capri by boat. The single peaked at number one in the United Kingdom and Ireland, while reaching number three on the continental chart, European Hot 100 Singles. It became Carey's second single to top the UK Singles Chart and Westlife's sixth consecutive number one single. The song has sold 440,000 copies in the total in the United Kingdom. It is Westlife's sixth biggest selling single (paid-for sales and combined sales categories) of all-time and their fifteenth most streamed single in the United Kingdom. The UK version of the single includes a limited edition Enhanced CD with video, poster and Westlife-only version and CD with Westlife video interview and picture sleeves. Due to its European success, the single is featured on the international editions of Carey's compilation albums Greatest Hits (2001) and #1 to Infinity (2015). English singer and The X Factor winner Steve Brookstein included "Against All Odds" on his debut studio album, Heart and Soul. It was released as his debut single on 20 December 2004 by Sony BMG. In 2004, Brookstein won the televised UK talent competition The X Factor, and recorded a cover of the Phil Collins 1984 hit "Against All Odds" as his debut single. It entered the UK Singles Chart at number two behind "Do They Know It's Christmas?" by Band Aid 20, and then climbed to number one, where it stayed for one week from 2 January 2005 to 8 January 2005 and was replaced by Elvis Presley's "Jailhouse Rock". "Against All Odds" was later included on Brookstein's debut album Heart and Soul. "Against All Odds" debuted at number two in the United Kingdom, behind Band Aid 20's version of "Do They Know It's Christmas? ", and at number 11 in Ireland. It charted at number one in the UK the following week. "Against All Odds" sold 127,701 copies in its first week in the UK, the lowest first-week sales for an X Factor winner's single until 2015. Brookstein's version has sold 204,000 copies in the UK to date, making it the lowest-selling X Factor winner's single. It has sold fewer than half the copies of Leon Jackson's "When You Believe" and Little Mix's "Cannonball", a third of Joe McElderry's "The Climb", a quarter of Leona Lewis's "A Moment Like This", and a fifth of those of Matt Cardle's "When We Collide", Shayne Ward's "That's My Goal", James Arthur's "Impossible" and Alexandra Burke's "Hallelujah". The next fewest sales from a winner's song was Sam Bailey's version of "Skyscraper", which had first-week sales of 149,000 copies, 26,000 more than "Against All Odds". However, Louisa Johnson, Matt Terry and Rak Su would all have lower first week sales in later years. American indie-electronic group The Postal Service covered "Against All Odds" for the soundtrack to the 2004 film Wicker Park. The cover was later named as one of the best cover songs of all time by the New York Post. The Shadows did an instrumental of the song in 1986 on their album Moonlight Shadows. In 2000, The Lettermen covered the song on their Greatest Movie Hits album. Welsh singer Bonnie Tyler released the song as a single from her 2003 album Heart Strings. Instrumental group John Tesh Project released their version from the album A Passionate Life. Michael Ball recorded the song and it appears on his albums The Movies, Stage and Screen and Seasons of Love. In 2013, Straight No Chaser covered the song with Collins on their Under the Influence album. Martin Nievera covered the song prior to his album Return To Forever. The song also features heavily in the first act of the This American Life episode "Break Up". The segment featured an interview with Collins, as well as narration from a woman who listened to the song to get over a break-up and vowed to write her own break-up song. ^ Eler, Alicia (13 August 2013). "Artist uses Phil Collins, Skype to construct online personae". Salon. ^ Danis, Kirsten (25 July 1999). "Phil Collins employee now his Swiss missus". New York Post. New York. Retrieved 17 November 2017. ^ Taylor, Chuck. "At AC Radio, Phil Collins' Take on 'True Colors' Is Shining Through". Billboard. 14 November 1998. ^ Stark, David (16 November 2002). "Collin's Writing Yields Hits For Many". Billboard: 38. Retrieved 3 September 2011. ^ "X Factor star ends Band Aid reign". BBC News. 2 January 2005. Retrieved 17 November 2017. ^ Morris, Chris (6 December 1986). "Early Music-Film Ties Best". Billboard. ^ a b c Hogan, Ed. "Against All Odds (Take a Look at Me Now)". Allmusic. Rovi Corporation. Retrieved 3 September 2011. ^ Tobler, John. "The Progressive Reign of Genesis" Archived 25 August 2005 at the Wayback Machine. Billboard Magazine. 7 March 1987. ^ a b c d e f g h Denisoff 1991, p. 406. ^ Denisoff 1991, p. 408. ^ a b Phares, Heather. "Against All Odds [Original Soundtrack]". Allmusic. Rovi Corporation. Retrieved 3 September 2011. ^ "Down The Academy". Los Angeles Times. Los Angeles. 31 March 1985. Retrieved 9 August 2015. ^ Wolmuth, Roger (8 July 1985). "Short, Pudgy and Bald, All Phil Collins Produces Is Hits". People. Retrieved 9 August 2015. ^ Hoerburger, Rob (23 May 1985). "Phil Collins Beats The Odds". Rolling Stone. Retrieved 2 October 2015. ^ Williams, Stephen (4 October 1985). "A Phil Collins Special And 'Miami Vice' on Record". Newsday. ^ Aaron, Charles. "Don't Fight the Power". Spin. November 2001. ^ Daniel Pearl. "Resumé". Retrieved 14 September 2012. ^ a b Denisoff, R. Serge; Romanowski, William D. (1990). "Synergy in 1980s Film and Music: Formula for Success or Industry Mythology?". Film History. 4 (3): 257–276, here p. 259. JSTOR 3815137. ^ "Remember back when MTV used to be cool?". Platypus Comix. Archived from the original on 1 September 2006. Retrieved 18 August 2006. ^ "Keith Williams IMVDb". IMVDb. Retrieved 17 November 2017. ^ Kent, David (1993). Australian Chart Book 1970–1992 (Illustrated ed.). St Ives, N.S.W. : Australian Chart Book. p. 71. ISBN 0-646-11917-6. N.B. The Kent Report chart was licensed by ARIA between 1983 and 19 June 1988. ^ "Austriancharts.at – Phil Collins – Against All Odds (Take a Look at Me Now)" (in German). Ö3 Austria Top 40. ^ "Ultratop.be – Phil Collins – Against All Odds (Take a Look at Me Now)" (in Dutch). Ultratop 50. ^ "Lescharts.com – Phil Collins – Against All Odds (Take a Look at Me Now)" (in French). Les classement single. ^ "Hit Parade Italia - Indice per Interprete: C". Hit Parade Italia. Retrieved 17 November 2017. ^ "Nederlandse Top 40 – Phil Collins" (in Dutch). Dutch Top 40. ^ "Charts.nz – Phil Collins – Against All Odds (Take a Look at Me Now)". Top 40 Singles. ^ "Norwegiancharts.com – Phil Collins – Against All Odds (Take a Look at Me Now)". VG-lista. ^ "Swedishcharts.com – Phil Collins – Against All Odds (Take a Look at Me Now)". Singles Top 100. ^ "Swisscharts.com – Phil Collins – Against All Odds (Take a Look at Me Now)". Swiss Singles Chart. ^ "Phil Collins: Artist Chart History". Official Charts Company. ^ "Offiziellecharts.de – Phil Collins – Against All Odds (Take a Look at Me Now)". GfK Entertainment Charts. ^ "Rainbow Review | Music Reviews and News". EW. 12 November 1999. Retrieved 17 November 2017. ^ Gardner, Elysa (31 October 1999). "Record Rack". Los Angeles Times. Retrieved 17 November 2017. ^ "Mariah Carey - Rainbow". MTV Asia. Archived from the original on 15 May 2013. Retrieved 17 November 2017. ^ "Rainbow | Album Reviews". Rolling Stone. 25 November 1999. Retrieved 17 November 2017. ^ "Ultratop.be – Mariah Carey – Against All Odds" (in Dutch). Ultratop 50. Retrieved 27 May 2015. ^ "Ultratop.be – Mariah Carey – Against All Odds" (in French). Ultratop 50. Retrieved 27 May 2015. ^ "Hits of the World" (PDF). Billboard. Retrieved 17 November 2017. ^ "Lescharts.com – Mariah Carey – Against All Odds" (in French). Les classement single. Retrieved 27 May 2015. ^ "Mariah Carey - Against All Odds" (in German). GfK Entertainment. Retrieved 27 May 2015. ^ "Italiancharts.com – Mariah Carey – Against All Odds". Top Digital Download. Retrieved 27 May 2015. ^ "Nederlandse Top 40 – week 29, 2000" (in Dutch). Dutch Top 40 Retrieved 20 May 2015. ^ "Dutchcharts.nl – Mariah Carey – Against All Odds" (in Dutch). Single Top 100. Retrieved 27 May 2015. ^ "Norwegiancharts.com – Mariah Carey – Against All Odds". VG-lista. Retrieved 27 May 2015. ^ "Swisscharts.com – Mariah Carey – Against All Odds". Swiss Singles Chart. Retrieved 27 May 2015. ^ "Rapports Annuels 2000" (in French). Ultratop. Retrieved 27 May 2015. ^ "Classement Singles - année 2000" (in French). SNEP. Archived from the original on 29 July 2012. Retrieved 27 May 2015. ^ a b "Jaarlijsten 2000" (in Dutch). Stichting Nederlandse Top 40. Retrieved 27 May 2015. ^ "Swiss Year-end Charts 2000". Hung Medien. Retrieved 27 May 2015. ^ Bronson, Fred (18 November 2000). "Found The 'Love' Of A Westlife Time". Billboard: 124. Retrieved 3 September 2011. ^ Copsey, Rob (12 January 2019). "Westlife's Top 20 biggest songs on the Official Charts". Official Charts Company. Retrieved 17 January 2019. ^ "Westlife Against All Odds UK DOUBLE CD SINGLE SET (166322)". Eil.com. 22 September 2000. Archived from the original on 20 October 2012. Retrieved 12 November 2011. ^ "Ultratop.be – Mariah feat. Westlife – Against All Odds" (in Dutch). Ultratop 50. Retrieved 27 May 2015. ^ "Ultratop.be – Mariah feat. Westlife – Against All Odds" (in French). Ultratop 50. Retrieved 27 May 2015. ^ "Hits of the world". Billboard. 21 October 2000. Retrieved 27 May 2015. ^ a b c Grampian Web Desing. "Westlife - Unbreakable - Greatest Hits Vol 1". Musicchartheaven.com. Retrieved 2 September 2018. ^ "The Irish Charts – Search Results – Against All Odds". Irish Singles Chart. Retrieved 27 May 2015. ^ マライア・キャリーのアルバム売り上げランキング (in Japanese). Oricon. Retrieved 17 November 2017. ^ "Nederlandse Top 40 – week 41, 2000" (in Dutch). Dutch Top 40 Retrieved 20 May 2015. ^ "Dutchcharts.nl – Mariah feat. Westlife – Against All Odds" (in Dutch). Single Top 100. Retrieved 27 May 2015. ^ "Official Scottish Singles Sales Chart Top 100". Official Charts Company. Retrieved 27 May 2015. ^ "Swedishcharts.com – Mariah feat. Westlife – Against All Odds". Singles Top 100. Retrieved 27 May 2015. ^ "Mariah Carey: Artist Chart History". Official Charts Company. Retrieved 27 May 2015. ^ "Årslista Singlar - År 2000" (in Swedish). GLF/archive.is. Archived from the original on 3 February 2015. Retrieved 17 November 2017. ^ "Best Sellers of 2000 – Singles Top 100". Music Week. London, England: United Business Media: 25. 20 January 2001. ^ Mariah Carey official top 20 best-selling singles in the UK MTV. retrieved: 3 May 2010. ^ "British single certifications – Mariah Carey – Against All Odds (Take a Look at Me Now)". British Phonographic Industry. Retrieved 30 October 2016. Select singles in the Format field. Select Gold in the Certification field. Type Against All Odds (Take a Look at Me Now) in the "Search BPI Awards" field and then press Enter. ^ Plunkett, John (19 December 2011). "X Factor: Little Mix have lowest-selling winner's single since 2004". The Guardian. London. Retrieved 21 December 2011. ^ a b Myers, Justin (9 December 2015). "The biggest selling X Factor winner's singles revealed". Official Charts Company. Retrieved 16 December 2015. ^ "Chart Track: Week 52, 2004". Irish Singles Chart. ^ "Steve Brookstein: Artist Chart History". Official Charts Company. ^ Huhn, Mary; Shen, Maxine (19 September 2006). "They've Got It Covered". New York Post. Archived from the original on 20 August 2007. Retrieved 27 November 2006. ^ "A Passionate Life overview". Allmusic.com. Retrieved 1 April 2014. ^ "The Movies". Allmusic.com. Retrieved 1 April 2014. ^ "Stage and Screen". Allmusic.com. Retrieved 1 April 2014. ^ "Seasons of Love". Allmusic.com. Retrieved 1 April 2014. ^ Collar, Matt. "Under the Influence - Straight No Chaser". Allmusic. Retrieved 2 November 2014. ^ "Return to Forever - Martin Nievera - Songs, Reviews, Credits - AllMusic". AllMusic. ^ "339: Break-Up". 24 August 2007. Retrieved 8 October 2013. Denisoff, R. Serge; Romanowski, William D. (1991). Risky Business: Rock in Film. Transaction Publishers. p. 768. ISBN 978-0-88738-843-9. Retrieved 4 September 2011.